When it comes to Americans defending themselves with a firearm, the ridiculous, Left-wing media gets hysterical. For some reason, to liberal reporters, this kind of rugged individualism reminiscent of our founding fathers is taboo. So it should come as no surprise that these same kooks go out of their way to exaggerate any story having anything to do with “weapons.” Enter the certifiably insane individuals passing themselves off as journalists at the New York Daily News. 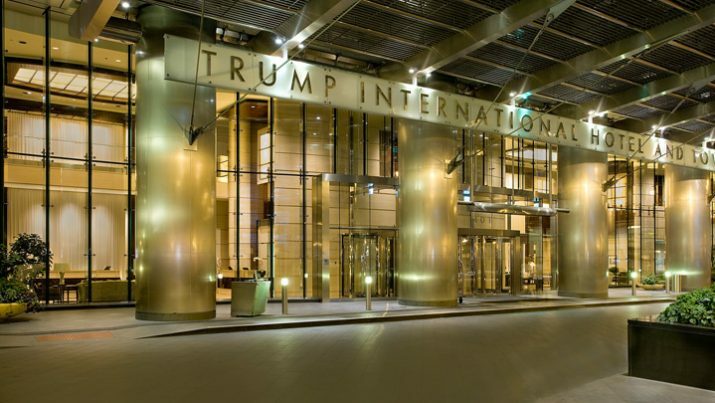 In recent days the NYPD arrested a 19-year-old college student at Trump Tower after Secret Service agents found a hunting knife and a powerful firework in his backpack. The student—Alexander Wang—told police he studies finance at Baruch College and that he’s a big supporter of the President-elect who likes to study at the billionaire’s home base, the Daily News reported. Wang arrived at Trump Tower around 6:35 a.m. on a recent morning and attempted to get past a checkpoint. After his bag set off a metal detector, Secret Service agents moved in and ordered him to open it. Inside they discovered the hunting knife, an M-100 firework, a Swiss Army knife, handcuffs, a flashlight, an 8-foot black rope, a clear water gun, a wire that is typically used for strangling someone called a garrote, and a laptop. To the lamestream media, this assortment—odd as it is—constitutes major weapons. There is also this: Wang, who was arrested for unlawful possession of fireworks and two counts of weapons possession (for the garrote and the hunting knife) told police he had never before had a problem carrying his back, “weapons” and “explosives” included—into the skyscraper located in NYC’s Midtown the nearly dozen times he visited. That included one visit two days after Trump defeated Democratic nominee Hillary Clinton, her second presidential loss. He said he carried the items in his bag because he is a self-described survivalist (another “taboo” word on the lunatic Left—so much individualism!) who enjoys shooting off fireworks off a pier along the East River. Police discovered more fireworks in his dorm room on Third Ave.; that prompted police to obtain a search warrant. In his dorm room police found more fireworks inside a military-style ammunition box. But they found no evidence of any connection to a terror or militia group and found no firearms. Check out that stereotyping, will you? To a crazy, Leftist “reporter,” if you carry any of these items and call yourself a survivalist, you must also be associated with a “militia” or “terrorist” group, because no one would identify as such voluntarily. There is nothing wrong with the Secret Service attempting to keep the president-elect safe. We get that. But this is more about the hysteria from the Left-wing ‘mainstream media’ that loathes anything having to do with someone being free-minded enough to want to take care of themselves. This college student had nothing more than a “Day Bag” for surviving in any major city—no more, no less.